You wake up and your alarm clock reads, “10:38am.” Your brain kicks into overdrive. “What day is it? Is it the weekend? Is it a national holiday? Do I have work today? I do have work today. I’m an hour and a half late to work. I’M AN HOUR AND A HALF LATE TO WORK! How is that possible? !” You forgot to set your alarm. And while this excuse reeks of laziness and disorganization, it is still a relatively viable excuse for your agonizingly silly blunder. As a young child, I always assumed that this poor excuse for an excuse would fall by the wayside. The primary line of thinking being that, eventually, alarm clock technology would become so hi-tech that there would be no way that anyone could possibly roll into work late because they clicked “PM” instead of “AM.” But that has not happened, because there isn’t enough technology in the world to make people remember the simplest things. And if it did exist, it wouldn’t be wasted on waking you up in the morning. After all, alarm clock-related incidents are almost exclusively caused by human error. So if alarm clock malfunctions are the bottom of the excuse totem pole, then what other technological advancements with unavoidable electronic downfalls can be used to your advantage? How about email? If I can be completely honest, at least one out of every four college papers I wrote were submitted late because I “typed in the wrong teacher’s email address,” which is the “my dog ate my homework” of college excuses. But a teacher isn’t going to fail a student for spelling their name wrong on an online document. And I know I’m not the only one who did this so don’t go getting all judgmental on me just yet. There will always be a reason not to do something. 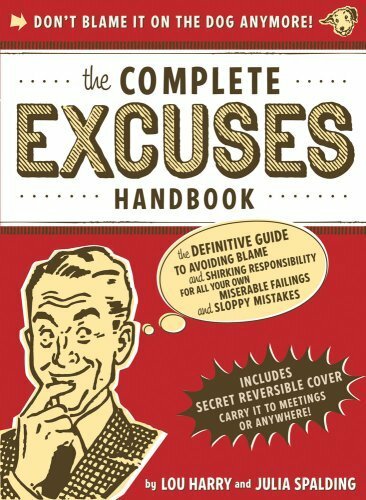 As the undeniably crude yet wildly appropriate saying goes, “Excuses are like assholes; everybody has one and they all stink.” So, instead of using technology to do as little as possible, use it to motivate yourself to create something great. Maybe, just maybe, it’ll be the next generation’s fool-proof excuse. Regarding employers, I find that it helps to admit something completely true but embarrassing once (Ex: “I’m sorry I’m so late. I had a few too many drinks last night. Won’t happen again.) and then they will be more apt to believe any other excuse you end up using. Great article! I love your blog’s name too!